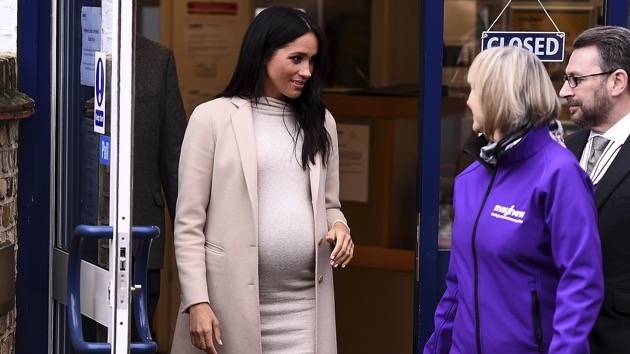 (LONDON) — Meghan Markle, who is due to give birth in April, showed all the graciousness of a royal when she expertly responded to a comment about her growing body. The exchange, which was caught on camera, came as Meghan visited Mayhew, a U.K. animal charity of which she is now patron. Markle, 37, gamely held some of the charity’s rescue dogs and petted others as she visited with staff and volunteers at Mayhew, which offers veterinary care and support for dogs and cats around the world. Markle is a known dog lover who had her rescue dog, Guy, by her side on the morning of her wedding to Prince Harry last May. One photo even raised speculation that Guy rode in a car with Queen Elizabeth II ahead of Harry and Meghan’s wedding at St. George’s Chapel in Windsor. The Duchess of Sussex paired a $35 H&M cream maternity dress with a cashmere coat by Armani for her visit to Mayhew. She also carried a bag made of vegan leather by Stella McCartney, who designed Meghan’s evening wedding dress. Meghan is taking over the latter two patronages, the National Theatre and Association of Commonwealth Universities, from Queen Elizabeth II. Meghan’s four patronages “reflect the causes and issues with which she has long been associated including the arts, access to education, support for women and animal welfare,” Kensington Palace said in a statement last week.